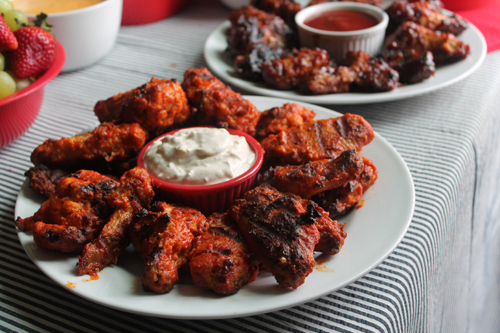 Chicken Wings, Blue Cheese Dip and a football party - Chocolate Chocolate and More! You can’t have chicken wings with out Blue Cheese Dip! I’m not a huge football fan. For me it’s all about the food while watching the game. The #MealsTogether. If you have good food, everyone will stick around for the game, whether they like football or not. Tyson Chicken Wings, Chips and dip, some veggies, a little fruit. Lots of drinks. And all close to the action. Putting together a nice spread was easy. The colors for the Falcons are red, black and white. The dollar store had all sorts of bowls and containers in red and my dishes are white. That’s the other thing you want for a football party. Easy. Canned and bottled drinks on ice. Finger foods. Plastic plates. And you don’t need a lot, just a few good items. Chips and dips are a must. Some veggies and some fruit. And wings. With Blue Cheese Dip. 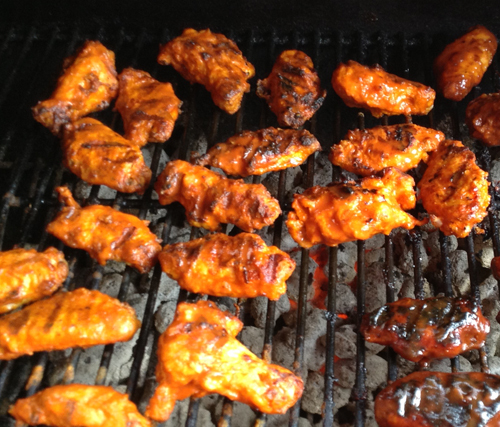 We love using the Tyson wings since they’re precooked and already sauced. Hubby and Cassie go for the Buffalo wings. I had to fight CJ and Grace for the Honey BBQ wings. You can cook them in the oven or like we did, grill them! When it’s game time just sit back and enjoy the game. And what a game it was! An emotional roller-coaster. Think you have the game won at the end of the first half, then start thinking you might lose during the third quarter, then the last 5 minutes of the game, you’re on the edge of the sofa, yelling at the TV! I hope we make it all the way to the end, and I hope the games are just as exciting as this one was. I might have to start learning some of the payer’s names. Combine all ingredients except cheese. Make sure well combined. Gently fold in Blue cheese. Refrigerate for at least 2 hours before serving for best flavor. Good food, great game and time together with the family. I am a member of the Collective Bias® Social Fabric® Community. This content has been compensated as part of a social shopper insights study for Collective Bias® and Tyson #CBias #SocialFabric #mealstogether All opinions are my own. First of all…go 49ers! Second of all, YUM! This looks amazing and I love the idea of using store-bought wings to cut out most of the work – so smart 🙂 Pinning and sharing on Facebook today! Thanks for the post and recipe. I’m not a huge blue cheese fan, but I think you’ve about got me talked into this! Will pin and give it a try. 🙂 Found you via a glimpse inside linky party. Yum! I didn’t know about the Tyson pre-cooked wings, thanks for the tip! And with this dip, oh my! A feast! These look great, Joan – especially the blue cheese dip! OH, homemade blue cheese dip! Going to have to make this for the Mr. I would totally ditch the ranch for this! Thanks for sharing at Wicked Good Wednesdays! I am sorry that SF won the NFC championship but this looks like a great spread for the Super Bowl! Homemade blue cheese dip? oh yes please! Thanks for linking at Show Me Your Plaid Monday’s! Your spread is fabulous! I’m not much of a football fan either but the parties are so much fun, it’s all worth it! Sorry your Falcons didn’t make it further 🙁 That is ok, food still makes for a great party! What a perfect snack to watch football with! You had one heck of a spread. Hubby and I are not much of sports fans, but got a bit engaged since the SF 49’rs were playing and we live in the Bay Area. Sorry your team did not win BUT you had one heck of a great party! Smile.! Oy vey! I know what I’ll be dreaming of tonight, that’s for sure! Sorry about ATL Falcon’s lost; but al least you had a great party! I’m sure those wings and blue cheese dip are a winner!